Two commentaries were made by Iwashita Akihiro and Konstantin Sarkisov, both long-time experts on Japan-Russia relations whom I respect. Iwashita’s comments are mostly related to the evaluation of Japan-Russia relations from the Cold War to the present, obliging me to explain why I see certain things as I do and why I cannot agree with some of his points. First, I will start with responses to Sarkisov’s comments, which touch upon the immediate future of Japan-Russia relations and serve also to put in context some of Iwashita’s comments on the future. Sarkisov concludes that I have an “optimistic” view on the current state of Japan-Russia relations. To be sure, I tried to make the following points: Putin made a clear statement in March 2012 to resolve the territorial issue based on the principle of a “draw”; for almost a full year the Japanese side did not do anything, and this delay is impermissible for the resolution of this drawn-out issue; and Abe’s April visit was important just to maintain a fragile momentum. I left no doubt that I hope that this momentum will now be maintained, and I warned that if the two governments fail to do so, there is a distinct possibility that the window of opportunity will be closed for the foreseeable future. I expressed my strong hope for determined movement to find a resolution, but nowhere did I predict that this would surely happen. Regrettably, I agree with Sarkisov that over nearly four months that have passed there has been no sign that things have really begun to take off. In fact at the time that I made my previous posting, I already had this fear that again negotiators might fail to act and “miss” the existing opportunity. The principal reason why on July 18 former ambassador to Japan Alexander Panov and I made our joint proposal to Nezavisjmaya gazeta was our joint fear that, once again, those in charge of negotiations were remiss in not seizing an evident opportunity. We began to have this fear already in early June, and it took more than a month to coordinate our views and come up with that joint proposal. We wanted to stimulate the negotiators by showing in a concrete format where both sides could claim, “I have not lost.” The logic was that Japan would gain something more than the two smaller islands, and Russia would not lose four islands in a bunch. In order to add a sense of realism, Panov and I decided to look for a formula within the existing proposals that the two sides have already made and not from our “creative or imaginative ideas.” So our joint proposal became an amalgam of the 1956 Joint Declaration and the Russian proposal made in November 1998: the transfer of Habomai and Shikotan (the smaller islands) to Japan and the creation of a new scheme with joint jurisdiction over Kunashiri and Etorofu (the larger islands). We wanted to show the outcome of one evening in early June, when Panov and I sat at a quiet restaurant in Tokyo, when I asked, “what is a solution for Russia not to lose?” and he asked, “what is a solution for Japan not to lose?” It was this approach that we wanted to encourage our negotiators to adopt in the negotiations to take place on August 19. I refrain from explaining in detail the background of how these paragraphs were actually prepared. Suffice it to say that as deputy-director of the European Department I was closely involved in drafting them. From that time, until we made the Kawana proposal in April 1998, all who were involved worked with genuine intentions to produce a format that would meet the spirit of that speech. When finally that Kawana format was formulated we sincerely believed that a no-winner, no-loser format had been found. Yeltisn’s personal positive response at Kawana underlined that feeling. Everybody on the Japanese side, including myself, did our best to sell the Kawana proposal to our Russian counterparts, but, increasingly, it became apparent that everybody on the Russian side except for the president was of the view that delineation of the borderline between Etorofu and Uruppu was a continuation of the “four islands in a bunch” solution. It was first replaced by the three-page proposal in November 1998 and then by Putin’s new approach in September 2000 to recognize the 1956 Joint Declaration. Incidentally, these two proposals became the basis of the Togo-Panov 2013 joint proposal. By September 2000 the formal content of Kawana apparently had lost all its vigor, but the spirit of Kawana survived very clearly in Putin’s administration, and took the form of the Irkutsk agreement, and eleven years later in 2012 was reproduced in Putin’s press statement in March. The similarity of Hashimoto’s 1997 speech and Putin’s press statement in 2012 is striking, even for a newcomer to this complicated issue. So how was the Togo-Panov proposal, which was straightforwardly drafted with the spirit of Kawana in mind, received in Japan? There is one correction needed in what Sarkisov wrote. The Japanese government did not refuse this joint proposal. The reaction by Suga, Cabinet General Secretary, was quite restrained and balanced in his July 19 press conference.3 He said that since this is a proposal made by private citizens the government is not going to comment on it. This is quite natural and understandable. And then he just repeated the most basic official position that Japan aims to “resolve the four islands issue through the conclusion of a peace treaty.” It should be noted that this long-standing formula is different from the “four islands in a bunch” formula requesting at a minimum that the sovereignty of four islands be transferred to the Japanese side. Here theoretically “resolving” could imply all sorts of solutions, Several Japanese newspapers showed an interest in making a report on this joint proposal. I have personally received quite a number of responses, most of them encouraging our exercise, none implying criticism of our joint endeavor. Then, will this joint proposal have some impact in stimulating Russian and Japanese negotiators to become really engaged in a genuine search for a no-loser solution on August 19? Naturally, I do not know. As for the three layers of IR that I discussed above, I think that there are objective conditions both in layer one international power politics and layer two the domestic power situation of the leaders in both countries, who are in a position to take decisive action based on their will and courage analyzed in layer three. Sarkisov rightly raised several misgivings, but they do not seem convincing enough to tell us in a determinist way that hope for a solution has been eradicated at layer one and two. Thus the outcome of the negotiations still depend on layer three, whether negotiators, of their own free will, would be able to come up with convincing ideas for the two leaders to make a decision in the not too distant future. 1. Kenneth Waltz, Man, the State, and War: A Theoretical Analysis (New York: Columbia University Press, 1954). 2. http://www.ioc.u-tokyo.ac.jp/~worldjpn/documents/texts/exdpm/19970724.S1J.html (accessed August 16, 2013). 3. http://www.kantei.go.jp/jp/tyoukanpress/201307/19_a.html (accessed August 16, 2013). The territorial dispute between Russia and Japan has a long history that produced a lot of negotiations and talks of various kinds on an official level. It also resulted in not so many, but important, official documents and numerous research books and articles, which were prepared by scholars who devoted their professional life to analyzing this problem. We should not overlook, also, intensive coverage at times in the mass media and commentaries by politicians and interested parties who put forward their personal views about the problem with the purpose of either solving it or leaving it to fester in light of other objectives. This has left a legacy of special terminology that shapes thinking when this problem is raised: "four-islands in a bunch," "two plus two," "two plus alpha,” “hikiwake," "fifty-fifty," etc. I doubt that any other territorial problem involving great powers has such a rich history and negotiating record. In light of this extensive record, we should be asking has a foundation been built to solve the territorial dispute between Russia and Japan, and, if so, what kind of a solution might be feasible if both sides are really interested in finding one at this time? First, I want to express an opinion, which may not be widely shared, that both Russia and Japan in 2013 actually would like to have this problem settled. Second, I would add that a foundation has been built, but it is only likely to be operational if special conditions are created by both sides. Third, the contours of an agreement require negotiations, but what Ambassador Togo and I published on July 18 roughly indicates a feasible way forward. Some elaboration on these points follows. On the first point, the fact that presidents Putin and Abe are interested in finding a path forward should not be seen as sufficient for an agreement. Some commentators have put too much weight on the role of strong leaders in Russia and Japan not only leading the way, but also solving the problem on the basis of their personal determination. I do not think so. Definitely, popular leaders are very important for persuading public opinion to accept an agreement that they are able to reach, including convincing people that this agreement was worked out in accordance with national interests and does not represent unjustified or unnecessary concessions. At the moment there are leaders in Russia and Japan with the support of more than 50 percent of the population, but this does not mean that all 50 percent will agree with a possible agreement. A consensus needs to be built behind the importance of a compromise solution. Second, we should be clear that the foundation built by negotiators on both sides assumes that political elites and public opinion leaders are ready to welcome a compromise, in which it is clear from the very beginning that no side can achieve 100 percent results in its favor. The special conditions essential for moving forward are not so much negotiations to make clear the foundation that already can be discerned, but education to persuade the political elites and public opinion on both sides to understand that the solution to the problem may be achieved only by concessions from both sides, as their details are worked out through negotiations. An absolutely indispensable condition for success are the efforts on each side to forge a new kind of relationship between the two nations, through which the compromise will be received as an agreement with a real friend. Trust must precede an agreement, not be assumed to be a natural consequence of reaching a deal. Third, the agreement itself will be scrutinized for signs of which side won or lost, as its political and economic consequences are weighed closely. This follows from a tendency to assess the process on the basis of which side, politically or economically, is "more interested" in reaching a deal. For instance, in the 1990s many Japanese scholars were predicting that weak Russia is very much interested in receiving economic assistance from Japan, and the outcome should reflect this balance of interest. Later, the so- called "China threat" was mentioned as reason for Japan to expect an advantage. The conclusion was clear: Russian leaders are ready to make territorial concessions. Some in Russia may now see Japanese talk of a “China threat” or Japan’s desire to replace nuclear energy with gas imports as tilting the balance in a similar fashion. Overcoming this habit of expecting an edge from the other side’s supposed weakness would contribute to more realism about what the compromise agreement is likely to contain. At the moment, I am not an optimist or a pessimist. I am a realist. I do not see that all of the necessary conditions for a possible compromise are already in place. Yet, the fact that negotiations have begun is a good sign, and, itself, may improve the atmosphere in bilateral relations. What we need to watch closely is whether that motivates many on both sides to be more active in finding a solution to this most difficult problem between Russia and Japan. How does the world stop the 2013 descent into rival alliances amid rising tensions? Sino-Japanese relations are at their worst since 1972. Russo-US relations are worse than at any time since the end of the Cold War. Sino-US relations were tested at Sunnylands in June, giving some observers hope of the start of a turnaround after falling to their nadir since 1972 apart from short-term setbacks in 1989-1992, 1996, and 1999, but the downward spiral has not been reversed. There is no promising summit on the horizon, no common threat or shared challenge that bodes well for turning things around. What is to be done? The responsible answer to this deteriorating situation, especially for the policy-watching community, is to avoid idealism. This means to be clear about the causes of the problem and what has failed to work. It also behooves the international community of specialists to strive by following debates in multiple countries to discern emerging developments. This means looking beyond the headline-generating events of the week to detect deeper trends. Evidence gathered for our Country Reports points to two trends that should be acknowledged as the starting point for informed responses to the situation at hand. As attention has focused on how Eric Snowden’s asylum quest affects Russo-US trust or how Abe Shinzo’s decision on whether to visit the Yasukuni Shrine after the victorious election to Japan’s Upper House affects Japanese relations with China and South Korea, we are in danger of losing sight of developments with greater long-term consequences. In Moscow and Beijing new articles are reporting on a spike in discussions about forming a military alliance. In Tokyo articles on Abe’s foreign policy after the election concentrate on plans to boost Japan’s alliance with the United States. These two trends are not whims of leaders reacting to recent troubles. They are steeped in the way these leaders and those around them have long sought to reconstruct national identities. Putin’s wrath toward the United States was pronounced in 2004-2008 and has been unsparing since he decided to be president again in 2011. Xi was part of the Standing Committee that put China on a much more confrontational course after the Beijing Olympics, and he has given no sign that he would reconsider as the top leader. Abe’s thinking about national identity should not be a mystery to anybody, and, whether or not a struggle exists over the Senkaku/Diaoyu rocky islands, he requires a substantial upgrading in the military alliance with the United States. What could stop the momentum? Those who argue that a path forward to reconciliation between rivals must confront some hard truths. One is that Barack Obama has taken a soft approach to Xi and Putin in the leadership transitions of 2012-2013 after starting with a soft line toward Hu and Medvedev in 2009. Moreover, he tried in 2009, and again when Kim Jong-un was consolidating power in 2012, an accommodating approach to the North Koreans. Despite the dovish reputations of his foreign policy team, there is no reason to expect new overtures from Washington to turn the tide. A second sobering truth for many in South Korea as well as China is that Abe’s normalization of alliance relations will find a receptive audience in Washington. Abe’s revisionist moves will not change this reality. There is a third force widening the divide that has so far escaped attention. In the Country Reports of the September/October issue, we review articles by Zhao Huasheng (Renmin luntan, July 24), Evgenyi Bazhanov (Nezavisimaia gazeta, August 2, Mezhdunarodnaia otnosheniia, August). They reveal that the case is now being made in both Beijing and Moscow to strengthen relations and establish an alliance, a major upgrading of bilateral relations with an obvious tilt toward closer military cooperation. Forces in China are now pushing for this, and there is a group around Putin who are giving it consideration. Such a decision on Russia’s part would fly in the face of its commitment since the mid-90s to multipolarity. The case against it appears to be strong, reducing Russia’s leverage in the Asia-Pacific region and leaving it heavily dependent on a stronger, assertive China. As seen in Bazhanov’s articles, the most promising track for heading off this train wreck is Russo-Japanese relations. Leaders were upbeat in starting negotiations. 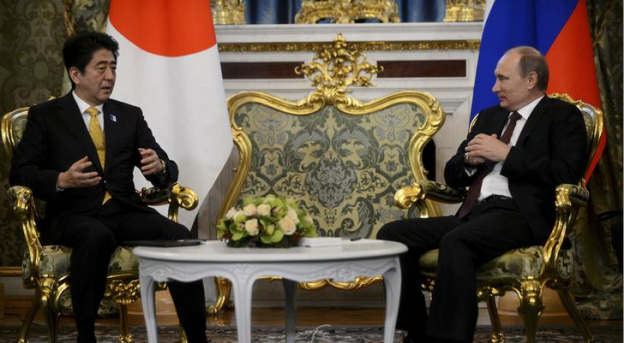 Russians view Japan’s interest as due to both the urgency of energy diversification and rising tensions with China. Bazhanov sees Russian interests as: the necessity of multipolarity rather than getting dragged into conflicts unrelated to Russia by becoming a pawn of China in the emerging polarization of the Asia-Pacific region; the importance of the development of Siberia and the Russian Far East avoiding the hegemonism of one state there and proceeding in line with modernization that breaks the self-induced impasse in Russia’s approach to foreign investment. While most observers are focusing on whether Abe has the will and clout to proceed expeditiously with negotiations focused on a territorial compromise as if that stands alone, recent Russian writings alert us to the significance of Japan as the test case for Russia’s entire strategy in the Asia-Pacific region as it stands at a crossroads between joining China in polarization of the region and making good on multipolarity.